Every living organism in universe, think in following pattern of thinking system. Working System : Ideas, Information, Thoughts and Actions. UNIT : Any single element (living or non living) that performs a work in order to accomplish a certain mission. EYE : is the Main Goal of a system. POWER : is any additives qualities in a unit like value, norms, efficiency in Eye. RESULTANT : Final output produced in EYE after series of complex interactions, computations. 1. LINEAR SYSTEM: Life things only a one-way traffic flow, unidirectional system. It has only one goal. It’s RESULTANT disregards other thoughts, it is tyranny ruler. However, the advantageous point is that this system is the beginning of a plan. 2. LATERAL SYSTEM: It is a one more or multiple parallel or opposite system of thinking to linear thinking system. It has two or more components, so it is comparable with 3 element: Profit or positive (+); Loss or Negative (-); Neutral (0). 3. 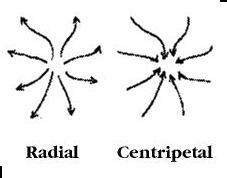 RADIAL SYSTEM: To Linear system, this system has either only in gaining or giving aspects: Centripetal and Centrifugal. A. Centripetal system: All units of working system flows into Eye, which costs to an eye. B. Centrifugal system: Opposite to centripetal, however, it will costs as Centripetal system. 4.UNIVERSAL SYSTEM: This is a system, I would like to introduce, as the real world working system is a super-complex and terribly unpredictable. Ultimately, the resultant is the focus of all units and EYE. Therefore, it is also the costs, benefits analysis; Profit or loss accounting. It assumes that Unit(s) is not necessarily a constant costs and power. It needs to be developed and advanced with time.